Tampa immigrant rights group protests Tampa city council, pushes for drivers licenses for all | Fight Back! Tampa, FL - A dozen people came together here, Feb. 26, to confront the city council and demand its members support drivers licenses for the undocumented. Alicia Gazga led the rally and chanted, "City council, shame on you!" and "What do we want? Licenses! When do we want them? Now!" "We were standing in the cold right outside the city council windows, demanding that they hear us out," said Michela Martinazzi of the Tampa Committee to Stop FBI Repression (CSFR). "The city council members and their aides were there too, they even stared down at us but ignored us and ignored our demands!" Feb. 26 marks the one-year anniversary of when the first protest against Tampa city council on this issue took place. 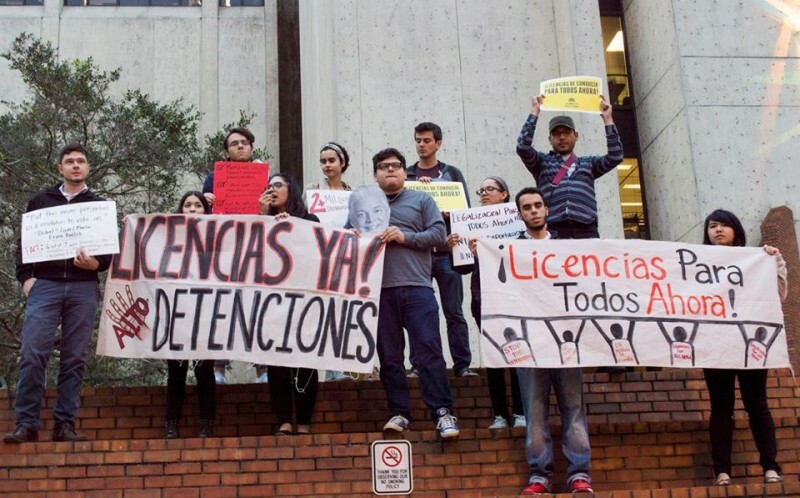 The protests were called by Raíces en Tampa to pressure the city council to publicly support drivers licenses being issued to the undocumented. The first protest in 2014 was called to pressure the city council to even meet with Raíces en Tampa. "Back in 2014, Tampa city council and their aides refused to even return our phone calls to meet with us," said Marisol Marquez of Raíces en Tampa. 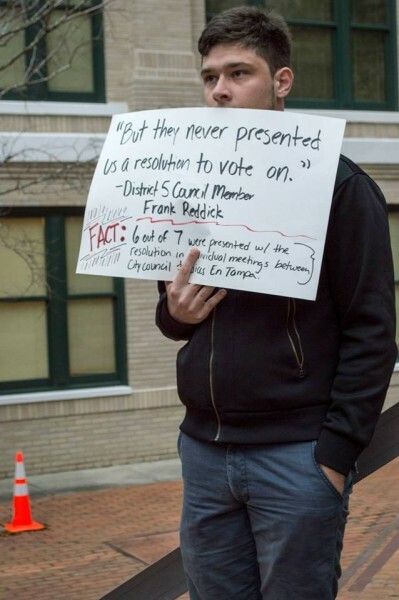 "After the protest, they began to call us back and we even met with six of the seven council members." During a public city council meeting, Raíces en Tampa tried to put their resolution up for a vote. City council meetings occur on Thursday mornings at 9:00 a.m., which are nearly impossible for most workers to attend. Over 20 community members took time off of work anyway to attend this meeting and publicly expressed to the city council why they should vote in favor of the resolution. Led by Councilman Charlie Miranda, the Tampa city council simply would respond with, "Thank you," after every community member spoke in favor of the resolution. Not documented on the minutes of the public meeting, at one point Councilman Mike Suarez silenced Raíces en Tampa member Marisol Marquez who to their faces, reminded city council they had indeed, met with Raíces en Tampa when they lied and said they did not. Some of the groups present with Raíces en Tampa were the Tampa CSFR, Tampa Bay Students for a Democratic Society and the Student/Farmworker Alliance. "My mom was driving with an expired license," says Alicia Gazga. "She was pulled over and was asked for her license and insurance. The cop told her that her insurance was not active, when it was. Then the cop told her to step out of the car, to call someone to pick up my two-year-old sister because she [the mother] was going to jail. When I came to pick her up my mom was already handcuffed and on the back of the cop car. My sister was terrified crying. No mother should she put in that situation!"